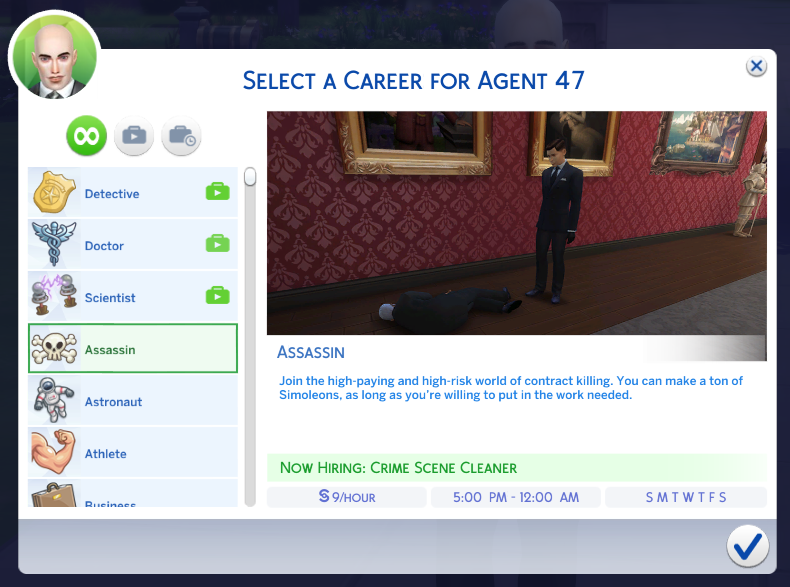 This is a custom Assassin Career, with 10 levels. Only one branch. 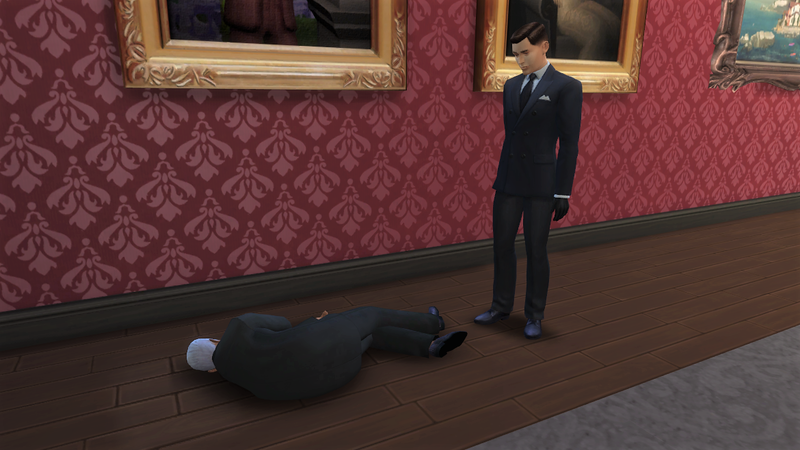 Currently, there are no chance cards, career rewards, or uniforms (I recommend using sims.modify_career_outfit_in_cas). The definition of a "dirty job." Dispose of any evidence of wrong doing, whether it's biological or otherwise. Bleach and thorough, fast work are musts. Be the friendly face to the unassuming vacuum repair shop that serves as the front to a deadly business. A charming smile and charisma will go far. Clothes make the man, and you makes the clothes. Stay away from the cheesy mustaches and stick to the basics. It may seem like a waste of time now, but designing the disguises will help hone skills for the future. Field all of the requests for "Problem Solving" that this company receives. It's essential to be able to differentiate the real potential clients from the fuzz, and that requires quite a keen eye. It's important to keep honing physical skills. They'll be needed later. Assassins out in the field need support. Targets need to be monitored and escapes need to be planned. That's where you come in. An unarmed assassin is a weak one. Take this opportunity to become well acquainted with the tools of the trade. The key is getting quality equipment, no matter the cost. Those on the job will need help getting past airport security, police checkpoints, and the like. Become great at this or agents will suffer. This is another necessary skill to becoming a master assassin. On a good day, you might be allowed to hold a weapon. Most days, follow quietly behind the professionals and keep your mouth shut. If you want to advance, keep developing your wits and physical prowess. Finally, something exciting. All of that grueling training was in preparation for this moment. Wits and a cool head are essential to keep jobs running smoothly and avoid detection. Careful but quick work will ensure a long, successful career. Your services are in extremely high demand and come at great cost. Jobs can be dangerous, but nothing that can't be overcome with expert skills and quick wits. Note that if you already have a copy of Neia_Careers_Commons.package, you do not need another copy.